M ore than 1,000 local artists are slated to perform six popular xoe dances of the Thai ethnic minority people in Nghia Lo town of the northwestern mountainous province of Yen Bai on February 14. The dances, collected by Lo Van Bien – a local Thai dance master, were once staged by over 2,000 local artisans in the largest-ever mass performance last year that set a Vietnamese record. Xoe is an important collective dance of the Thai people who develop about 30 different variations of the dance. The dance is charmed by its gentle and alluring rhythms. 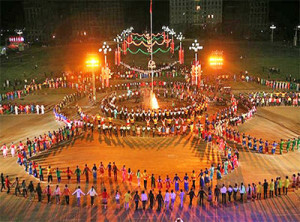 Dancers usually form a circle around a festive flame and move to the sound of melodic traditional music. It plays a significant role in the country’s traditional dance canon, depicting the daily lives of the Thai ethnic groups and showing their wish for a peaceful and prosperous life. Han Khuong – a unique traditional festival of the Thai inhabiting the Northwest is scheduled to take place the same day in Nghia An town. During the festival, with “Han” meaning stage and “Khuong” meaning yard, young boys and girls together build a one-entrance stage with the height of 1.2-1.5 meters surrounded by wide-meshed bamboo lattice, where they enjoy dancing, singing together, making friends, and taking part in competitions. It is a brilliant chance for participants to find their future spouse. The organisation of such events is part of efforts to develop Nghia Lo into a destination of culture and tourism, according to Deputy Chairwoman of the district People’s Committee Hoang Thi Hanh. The project focuses on boosting a culture and sport environment tailored to meet the tastes of ethnic compatriots along with promoting the community-based tourism from 2013 till 2020.